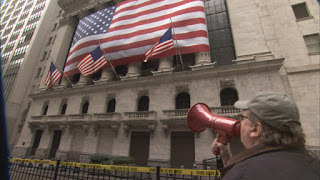 "I pledge allegiance, to the sound of my own voice..."
Capitalism: A Love Story is another entry in Moore’s canon of dogmatic documentaries designed to purvey his brand of leftist populism. Whether that appeals to you or not always hinges on your political bent. Many – include I – have proclaimed that it is possible to detach oneself from Moore’s politics and enjoy his work for its chutzpa and entertainment value. Frankly, in retrospect, that is a pipe dream. If you are a Moore devotee still clinging to this illusion of objectivity, ask yourself this question: If a well-made, humorous documentary was produced to promote lax gun control laws, the further privatization of health care, or ending the so-called “welfare state,” could you overlook your principles and enjoy the film as mere entertainment? Unlikely. Moore understands and embraces his role as a polemicist. He unabashedly preaches to the converted and undecided while demonizing those outside his revival tent. This is never more so than in Capitalism, which marks Moore’s return to a subject he broached 20 years ago in his first feature film, Roger & Me. Indeed, like a comeback concert, Capitalism opens with Moore trotting a few golden oldies: filleting Reganomics, bemoaning the demise of his hometown of Flint, Mich., and taking another trek up the front steps of General Motors’ headquarters in a vain attempt to harangue anyone who’s still left to turn out the lights. Unlike Moore’s most recent cinematic efforts, Capitalism is a broadside attack against the haves in the name of the have-nots, less focused on a single issue than an economic system that Moore pointedly brands as “evil” and “immoral.” For support, he employs the services of several Catholic priests, who heartily reiterate the Church’s longtime (and somewhat hypocritical) distain for the poverty inherently perpetuated within a capitalistic culture. It is Moore at his shrewdest, adopting one of conservatism’s most favored weapons – religion – and wielding it jujutsu-style against them. Moore also slyly outsources the job of proposing specific solutions to America’s allegedly decadent financial framework to, of all people, Franklin D. Roosevelt. In researching this film, Moore discovered long-lost archival video footage of the portion of Roosevelt’s 1944 State of the Union address – which the ailing President delivered from the White House – in which he proposes a second Bill of Rights guaranteeing all Americans, among other things, a home, a job with a living wage, education, and medical care. Like most of Moore’s movies, Capitalism is a mixed bag. The film soars when Moore takes dead aim at obvious examples of corporate greed and corruption. The $700 billion Wall Street bailout approved during the waning days of the Bush administration, judges locking up juveniles to fund a for-profit prison in Pennsylvania in which the judge had a financial stake, and the practice of employer’s surreptitiously taking out so-called “dead peasants” life insurance policies on their employees – essentially betting on their deaths – are low-hanging fruit ripe for Moore to pluck. On the other hand, Moore’s oeuvre of manipulative editing, juvenile japery, and cheap theatrics has rarely felt more tiresome. He often seems more intent on firing the last shot in his war against George W. Bush. He lays bare the corporate ties of Goldman Sachs execs and Clinton/Bush appointees Timothy Geitner and Larry Summers (along with Robert Rubin and Alan Greenspan) but says nary a word against President Obama for nominating each to high level economic posts in his administration. Instead, he treats Obama’s election solely as the first shot in a populist uprising against American plutocracy. And, for most people, there is a difference between being evicted for defaulting on a 30-year, fixed-rate mortgage and losing the family homestead due to higher property taxes brought on by the insidious, systemic squeeze of gentrification or municipal rezoning. Not in Moore’s world, where perspective takes a backseat to heart retching scenes of crying children and sheriff’s deputies bashing in doors to eject squatters. Lingering over shots of vacant lots where factories stood 60 years ago is sheer sentimentality. “Trying” to make a citizen’s arrest of banking CEOs or wrapping crime scene tape around Wall Street office buildings is, ahem, Moore of the same. But, when Capitalism: A Love Story undresses thieves in suits and how their influence peddling has corrupted the highest levels of our government and disenfranchised the masses, it justifies its creator’s antics.